Desktop alerts are automatically displayed when enabled for a task or event. The Preview button in the desktop alert settings can be used to see how the desktop alert will appear. 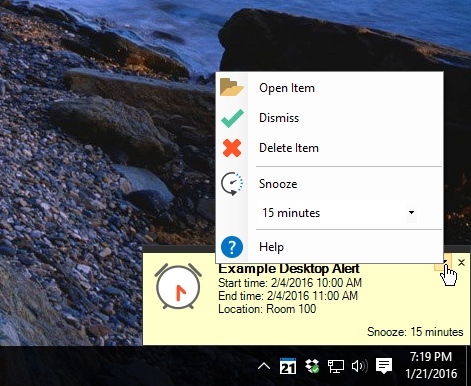 The Recent Reminders window can be used to redisplay previously snoozed or dismissed desktop alerts. Desktop alerts can be displayed to remind you of upcoming or past-due events or tasks. This reminder type can be specified in Event Editor and Task Editor windows. A desktop alert is similar to the new message alert that some email programs provide. It's a small, unobtrusive window that fades into view in the lower-right corner of the screen. Depending on your needs, you may prefer this type of reminder over the larger Popup Reminder window. Each desktop alert can contain a thumbnail picture and have an associated sound that is played when the alert becomes displayed. Desktop alerts can play voice reminders. The color of the desktop alert will match the color of the associated event. Multiple desktop alerts can be displayed at the same time. When this happens, they will be automatically arranged so they do not overlap or obscure each other. Desktop alerts can be snoozed or dismissed. When a reminder comes due, a desktop alert will be displayed in the lower right corner, as shown in the example below. To open the associated event or task in the Event Editor or Task Editor, respectively, click the title, time, or location text. To snooze the reminder for a default or previously used length of time, click the Snooze text in the lower-right corner of the desktop alert. 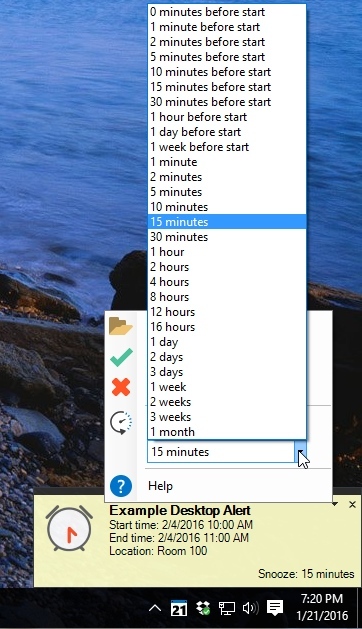 The snooze length can be changed by expanding the menu in the upper-right corner of the desktop alert. To dismiss the reminder, click the X in the upper-right corner of the desktop alert. You can click and drag the reminder to any location on your screen, where it can act as a sticky note. If the reminder is snoozed, the next time it appears it will be the same position where it was dragged previously. To view the desktop alert menu, click the down arrow in the upper-right corner of the desktop alert. After clicking the down arrow, a context menu will be displayed. Help - This will launch a browser displaying this help documentation. Open Item - This will open the associated event in the Event Editor or task in the Task Editor. You can also open the event or task by clicking the title, time, or location text in the desktop alert. Dismiss - This will dismiss and close the desktop alert. It won't be displayed again. You can also dismiss the reminder by clicking the X button in the upper-right corner of the desktop alert. Note if you accidentally dismiss the reminder, it can be easily redisplayed by selecting the reminder from the Recent Reminders window or commanding Undo from the Edit menu. Snooze - This will snooze the desktop alert for the default or previously snoozed length of time. You can snooze for a different length of time by selecting a value from the list. If you accidentally select the wrong snooze time, you can redisplay the reminder from the Recent Reminders window or command Undo from the Edit menu, and then select the snooze length you'd like. The selected snooze length will be the default the next time the reminder appears.